Betser is not the first online betting site to decide to try its hand at creating an online casino to bring in some extra customers, nor is it likely to be the last. We have seen countless betting sites attempt this transition, and it is fair to say that the results have been incredibly varied. Some have evolved into one-stop shops for all a customer’s betting needs, while others have been less successful, resulting in either the casino feeling like an afterthought, or worse, like neither the sports betting or casino sites have had enough work put into them. So, this isn’t a decision that can be made lightly, if Betser was to achieve its aim of creating a standalone casino offering that could be considered as a different entity from the sports betting site, a lot of effort was to go in. This doesn’t only include ensuring that there is sufficient content to keep casino players happy, it also involves creating a design for the site which differs it from the betting site, while keeping it on brand. It’s no easy task, and its no surprise that a bunch of betting sites have failed at it in the past, will Betser be joining their numbers? At the time of writing, there is an unfortunate touch to the design at Betser. There are thumbnails on the homepage which allow instant access to games, which is expected of a casino by this point, some of which are under the header ‘Popular’. The problem is, there are six spaces for thumbnails in this category, and two of them are blank, suggesting there are not enough popular games at the Betser Casino site to fill six spaces, which is somewhat embarrassing. This is undoubtedly not the case, and will just be an oversight on someone’s part, but it isn’t a great first impression. 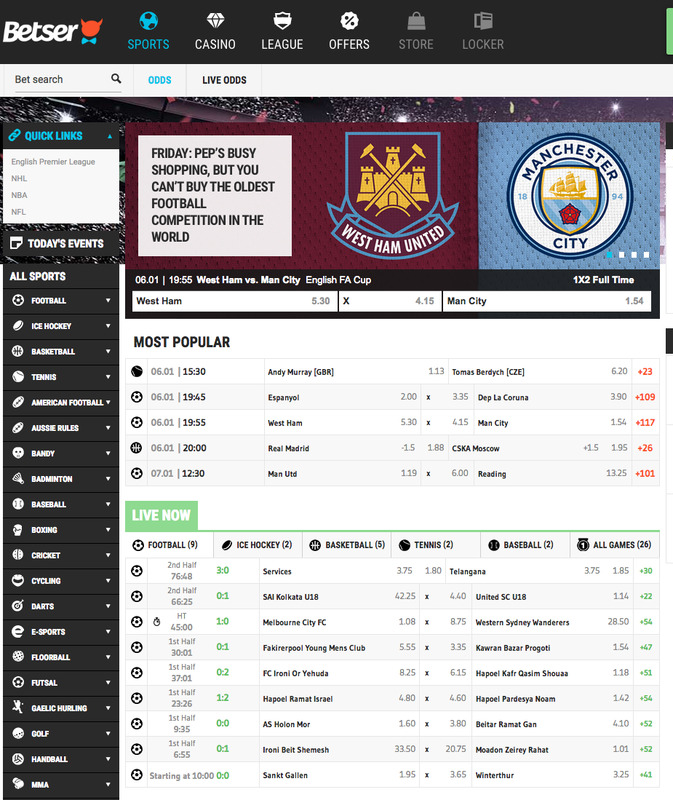 The design of the site in general is pretty disappointing, the is very little to differentiate it from the sports betting site, the banners and logo are essentially the same, as is the colour scheme. The background behind the aforementioned thumbnails, which is an excellent place for some personality, is a plain white and boring, plus, combined with the missing spaces, makes the site feel unfinished. Betser really had to bring something to the table here to show genuine effort had gone into creating an impressive online casino, and it simply does not feel like it has. What Betser Casino really needs to separate it from its older sibling, the sports betting site, is a bunch of games that would rival even the best of its competitors. Unfortunately, that is not what you get here, instead, Betser offers a limited selection of games from the likes of Microgaming, NetEnt, Play'n GO, Playson, Quickspin, and Yggdrasil. 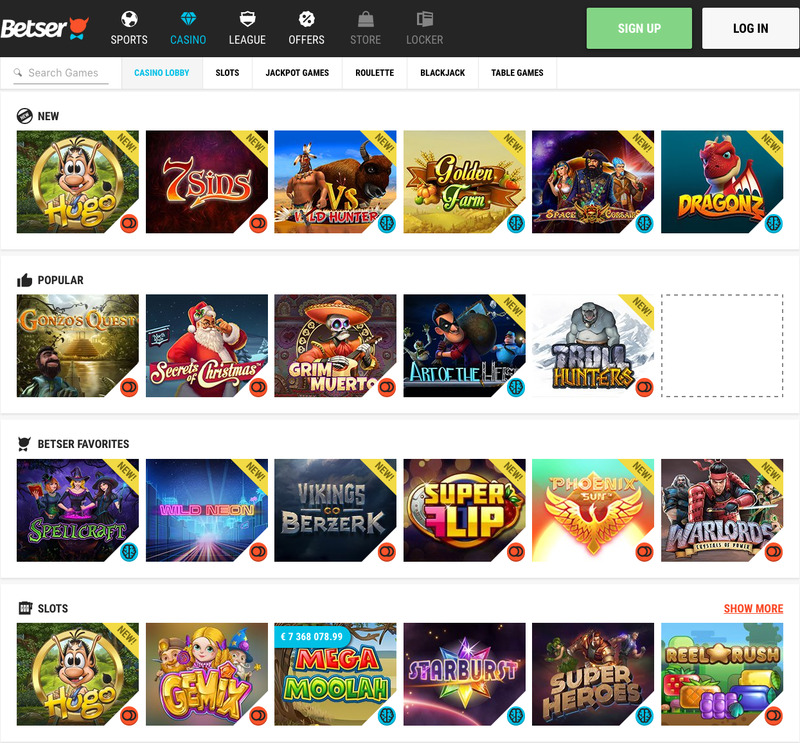 There is nothing wrong with these developers, in fact, they are all among the very best around, but when you have other sites that offer all the games available here, as well as a host of other titles from even more providers, Betser just doesn’t seem like a viable alternative. Game categories are varied, which is nice, with slots, table games, blackjack, and roulette, but there aren’t really enough of any of them, and the noticeable lack of any live dealer games also puts this site behind the 8-ball when it comes to trying to get established. Betser will always be a top-notch online sports betting site, and the abysmal attempt at creating an online casino won’t change that, but if you’re looking for somewhere that is casino focused, then this is not the choice for you.